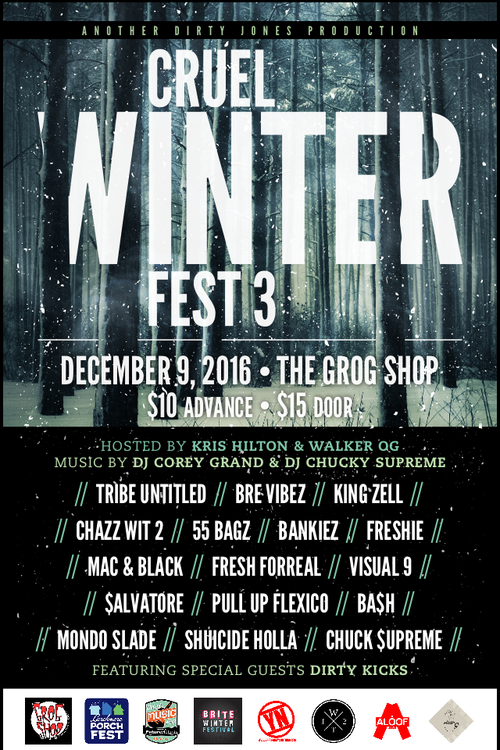 A fixture on the local scene for the past ten years, Wallace Settles (aka Dirty Jones) is the promoter behind the local showcase Cruel Winter Fest, which takes place tonight at the Grog Shop. This year’s incarnation of an event that’s billed as “the only annual independent hip-hop festival in Cleveland” will feature more than 15 diverse acts at the Grog Shop and B Side Liquor Lounge. Ohio Hip Hop Award winner Kris Hilton and prominent Cleveland hip-hop artist Walker OG will serve as the hosts. DJ Corey Grand and DJ Chucky Supreme will spin between sets. (Jeff Niesel), 7 p.m., $10 ADV, $15 DOS. Grog Shop. Local singer-songwriter Ray Flanagan launched Ray Flanagan & the Authorities in late 2012. Though the group has gone through different incarnations, the guys have been going strong ever since — last year’s A Hard Shell to Break established Flanagan and Co. as one of the better indie rock acts on the local circuit. Tonight's show serves as a release party for a new single, "Plants by the Water." It also serves as the debut for a new lineup of the Authorities. Also on the bill are Daniel Rylander, who just released the new single "White Elephant," and Gretchen Pleuss, who recently issued the LP From Birth, To Breath, To Bone. 9 p.m., $5. Happy Dog. Skillfully blending the various circles he walks in — turntable traditions, classical music education, folk composition — p.stoops brings a unique element to Cleveland’s electronic scene. Tonight, he officially releases his new album, Ancient Computers, and we’re excited to see how that plays out. We checked out some of the unmastered tracks ahead of time, and it’s pretty cool stuff: Imagine Hawaiian steel guitars mingling with volcanic springs of orchestral strings, all sampled against hip-hop beats. It’s heady, it’s danceable and it’s entirely of its own world. Stoops is also a former Scene intern, and we’ve enjoyed watching his music evolve since those days. (Eric Sandy), 9 p.m., $8 ADV, $12 DOS. Beachland Tavern. After dissolving his Manchester, England-based project Working for a Nuclear Free City in 2013, Gary McClure rebranded himself as American Wrestlers. The transatlantic name serves as a premonition for McClure’s move to St. Louis shortly after the release of his self-titled debut. For his 2016 follow-up, Goodbye Terrible Youth, McClure bolstered his lo-fi dream pop with a full backing band that includes his American bride. Melding old-school indie rock jangle guitar with McClure’s melodious voice and ear for pop, American Wrestlers will bring fans of Big Star and the Replacements under the same roof as followers of Fun. or Passion Pit. (Bethany Kaufman), 9 p.m., $10 ADV, $12 DOS. Mahall's 20 Lanes. With a band history that dates back to 1965 — more than 50 years! — Savoy Brown maintain a reputation as a touring band’s band, one that has traced the curve of American blues rock under the aspirational work of frontman Kim Simmonds. The current incarnation places Simmonds front and center, even in the band’s name (there have been, like, 300 million other musicians in Savoy Brown over the decades), and the band has been touring pretty hard in the wake of last year’s The Devil to Pay. It’s a solid album that covers all the ground you might be looking for in a blues record ca. 2016. It feels fresh and old-school, and Pat DeSalvo and Garnet Grimm, the band’s rhythm section since 2009, come through clear and sharp as hell. Check “Bad Weather Brewing” for proof. (Sandy), 8 p.m., $22 ADV, $25 DOS. Beachland Ballroom. Starting with tonight's show at the Agora, Southern Ohio Multimedia and SamJam Promotions, organizers of the SamJam Bluegrass Festival in Piketon, Ohio, will begin hosting "periodic one-day events" in the Cleveland area. The first event in the series features an eclectic mix of music that includes The Voice’s Adam Wakefield, the Steeldrivers and the Seldom Scene. (Niesel), 6 p.m., $42.50-$47.50. The Agora Theatre. Even if she never writes another song, Hersh will have left behind a remarkable legacy. When they were still teenagers, she and best friend/stepsister Tanya Donnelly started the Muses, which they’d rechristen the Throwing Muses. That band would achieve critical acclaim during the ’80s and into the ’90s, issuing art-punk album that showed off Hersh’s poetic sensibilities. While the Muses still tour and record, Hersh, who also fronts the power trio 50FOOTWAVE, devotes most of her time to her solo career. The solo acoustic tour that brings her to the Music Box comes in support of her terrific new album, Wyatt at the Coyote Palace, a double CD/ book combination. 7:30 p.m., $20 ADV, $22 DOS. Music Box Supper Club.